With the millions of students protesting their government’s action on climate change, or in some cases, the lack thereof, it’s impossible to ignore the situation at hand. In the last decade, it’s become increasingly more difficult to avoid hearing about government action on climate and sustainability. It was just last month that Alexandria Ocasio-Cortez, one of the new fresh faces of the Democratic party, introduced a bill, The Green New Deal. This was a bill that made huge waves in politics and got just about everybody talking about it. Just like anything in politics today, it’s hard to read and locate the single truth without doing a bit of your own research. Both Democratic and Republican party members are quick to jump to opinions without actually reading the proposals. Whether the deal is good or bad is up to you to decide after hearing the facts of the matter. So, what exactly is the Green New Deal? 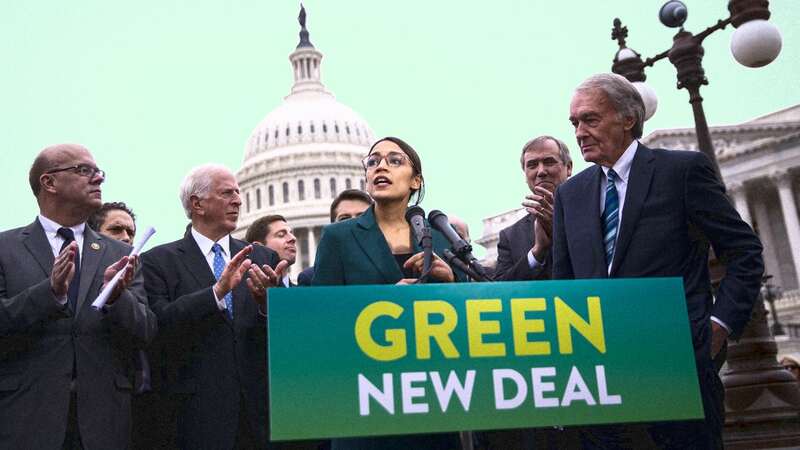 In general, the Green New Deal is a congressional plan that promises a more sustainable America by calling “on the federal government to wean the United States from fossil fuels and curb planet-warming greenhouse gas emissions across the economy. It also aims to guarantee new high-paying jobs in clean energy industries.” (Friedman, 2019). Looking at this as a bigger picture, it’s almost impossible to see why anybody would be against it, considering all the benefits that the proposal seems to have. But after reading the proposal in depth, it’s a bit more obvious as to why people would be weary. “Global warming at or above 2 degrees Celsius beyond pre-industrialized levels”. The proposal goes on to reference related crises including wage stagnation, life expectancy decline, and income inequality (i.e. the top 1 percent, racial wealth divide, gender earning gap). With all of that in mind, it’s clear that the United States can greatly benefit economically by putting forth quite an effort to create millions of jobs in order to create job security.
. to promote justice and equity by stopping current, preventing future, and repairing historic oppression of indigenous peoples, communities of color, migrant communities, deindustrialized communities, depopulated rural communities, the poor, low-income workers, women, the elderly, the unhouses, people with disabilities, and youth. The problem? The cost isn’t clear yet. While President Trump claimed it would cost $100 trillion for the entire nation if the Green New Deal were to completely be followed without any amendments, it’s near impossible to figure out how much exactly it will cost. While the cost is one of the biggest issues opponents of the Deal reference, there is a lot of data showing that the costs would reap even bigger benefits. One example is that in Vermont, where the state has a goal to achieve 90% renewable energy by midcentury, the cost is estimated to be $33 billion. Yet, the state is receiving great job growth in clean energy, which greatly helps the transition and making it cost-effective. Additionally, in 2011, there was a study done by the Electric Power Research Institute which reported back that the cost of putting the entire nation on the electric grid would cost $476 billion. The benefits? $2 trillion (Friedman, 2019). Another huge issue? A lot of people are feeling that the Green New Deal is attacking farmers and ranchers. This is in reference to the line which states, “working collaboratively with farmers and ranchers in the United States to eliminate pollution and greenhouse gas emissions from the agricultural sector as much as is technologically feasible”. There are specific Republican congressmen that are pitting their constituents against the deal by saying that the Deal aims to attack and completely eliminate their cheeseburgers and ice cream. Say what you will, but that’s asinine and not going to happen. The latest is the big problem that people see in the transportation industry. The deal envisions sourcing 100% of the nation’s electricity from zero-emissions power by digitizing the power grid. This goes along with upgrading every single building in the country to be more energy efficient as well as in completely re-doing the national transportation system to transition to electric vehicles and high-speed rail like those seen in Europe. Regardless of where you stand on the issue, it’s impossible to ignore that thus far, there have been no other solutions proposed to this same issue. While you absolutely do not have to agree with Ocasio-Cortez on the matter, we must admit that it’s great that the conversation has finally been brought to the table. This Deal will absolutely make a difference during the upcoming Presidential election, as candidates have already begun to publicize their stance on the environment and sustainability. It’s clear to see that regardless of how you believe we should fix this issue, it’s about time we all recognize that this issue is big and that the United States is far behind in sustainability. Please remember, there is no planet B.